Satana is a fictional character, a half-demon appearing in American comic books published by Marvel Comics. She is the sister of Daimon Hellstrom and the daughter of Marduk Kurios. Satana first appeared in Vampire Tales #2 (cover-dated Oct. 1973). 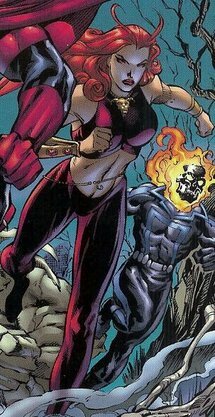 She was created by Roy Thomas and John Romita Sr..
She appeared as a regular character in Thunderbolts since issue #155, and remained with the team when the title transitioned into Dark Avengers beginning with issue #175. Satana and Daimon were born in the fictional town of Greentown, Massachusetts. They were the half-human children of Satan (their father was later retconned into a demon named Marduk Kurios who posed as Satan). Satana and her brother were groomed by their father to be evil, but Daimon rejected these teachings, while Satana embraced them. When Satana was still a child, her mother, Victoria Wingate, discovered her husband and children's true nature and was driven mad. Daimon was raised by servants, while Satana was taken to her father's particular Hell-dimension (of which there are many in the Marvel Universe) and taught black magic. As a reward for her devotion to him, Satana's father gave her a familiar named Exiter, with whom she formed a close bond. Satana began studying magic under her father and the demon Dansker. In Hell, her soul was bonded with an evil spirit called the Basilisk (not to be confused with the Basilisk) in order to increase her magical power. As an adult, Satana was banished to Earth by the Four as a succubus, draining the souls of men. When she does this, the victim's soul transforms into an ethereal butterfly; Satana then consumes its essence by eating it. She also possesses the ability to gain strength through the use of weapons that were used to kill a living being. In order to do this, she merely places a portion of her own blood on the chosen weapon. She used both her magic and sexual wiles to get the victims she needed. Satana from the Witches series, drawn by Mike Deodato. As a succubus, she stalked victims in New York, and then in Los Angeles she befriended a Satanist named Ruth Cummins. When Ruth was killed, Satana avenged Ruth's death by destroying Darkos Edge and Harry Gotham. She later battled the Four, a mystic cabal. During Satana's first time in the mortal dimension, she was attacked by Monsignor Jimmy Cruz and his band of soldiers. During this battle, Cruz summoned demons called the N'Garai. Exiter tried to fend them off but was killed trying to protect his mistress. Though she was too late to save her beloved Exiter, Satana gained her revenge by killing Cruz and consuming his soul. She confronted her father, who was disguised as Miles Gorney, and defied him by saving Michael Heron's soul from him. Some time later, Satana was seemingly destroyed by her brother Daimon Hellstrom, but she defeated the demoness Kthara. She was transformed by the Camarilla of the N'Garai into a human, Judith Camber. She was restored to normal, and destroyed the Camarilla. Eventually, however, the demon to which she had been bonded began to desire its freedom. The Basilisk managed to put a curse on Doctor Strange, basically turning him into a werewolf. With the help of Spider-Man, Satana was able to free Strange's soul from the curse, but the Basilisk was released in the process, and stabbed her in the back with a mystical blade. Satana died laughing, however, because their life-forces were still bound together; by killing her, the Basilisk had sealed its own fate as well. She had thus sacrificed her life to cure Strange of lycanthropy. As a supernatural being, however, Satana's death was not permanent. Her spirit returned to her father's realm of Hell for a time, until she and a cabal of demons arranged to have her soul (among others) placed into a soulless body on Earth. There she began to build her powers again, preparing to return to Hell and conquer her father's realm. At some point she apparently died again. In the short-lived Marvel series Witches, Satana is resurrected again by Doctor Strange and teamed with two other magic-wielding females to defeat a powerful mystic enemy called the Hellphyr, which was a front for her father Marduk Kurios. According to that series, the three witches formed a coven in order to protect the Tome of Zhered-na (a powerful Book of Shadows belonging to the Kale family) from would-be thieves such as Doctor Strange. After a brief cameo in Nick Fury's Howling Commandos, Satana has been shown to have reverted to her former wicked ways; reaping souls in Manhattan and plotting her father's overthrow from the comfort of a desecrated church. Despite her fatherly conflict, Satana revealed that for every mortal victim she takes, she must offer the 10th victim as supplication to her father. The Hood seeks her out to find out more information about Dormammu. Some time after the fall of the Hood, Luke Cage and Doctor Strange attempt to apprehend her for working with the Hood and to get her to join the Thunderbolts. She is initially resistant, but happily agrees when she realizes she will get to work with Man-Thing. In the course of Marvel's Deadpool Team-Up series, Satana loses her soul to four geeks in a high-stakes poker game, and she subsequently seeks out Deadpool's help to get it back. Deadpool discovers the poker-playing geeks are actually demons debating which will marry Satana to become the heir to Hell. Deadpool comes up with a plan to swindle Satana's soul back from the demons: he marries her, binding their souls together. Satana strengthens Deadpool's katana swords with his own soul power to make the inevitable fight with the demon suitor more evenly matched. When the demon comes to take Satana as his bride Deadpool produces the marriage certificate, denying the demon his bride. The demon then points out the loophole—marriage is only valid until death; therefore, he decides to kill Deadpool. In the ensuing battle, Deadpool uses his soul-enhanced swords to easily dispatch the demon. Afterwards, Satana slips off and leaves Deadpool a letter explaining the inevitable divorce. She indicates she will be keeping half his soul—her entitlement in the divorce settlement. Satana from Vampire Tales #3, drawn by Esteban Maroto. Satana is a half-demon/half-human hybrid, and a succubus; she has some innate mystical abilities inherited from her father, as well as some that her father granted to her. As a succubus, she is able to extract and feed upon the psychic energy of human male souls to increase her abilities and magical power; for a time, Satana had to extract and feed upon the psychic energy of human souls periodically to survive. She has the ability to manipulate magical forces for a variety of effects, including inter-dimensional teleportation, levitation, and the projection of concussive bolts of eldritch energy in the form of "soulfire" or hellfire. She also had a limited ability to hypnotize her victims and control their minds psionically. If she touches an object used to kill someone (like a knife or sword) she can absorb its "blood energy" to become stronger in proportion to the souls the weapon has taken. She also has superhuman strength. For a time, she had the ability to contain the Basilisk, a powerful demon, within her spirit and to release it to do her bidding and then return within herself. Satana also trained in the mystic arts and learned how to cast spells and perform witchcraft. She was trained by her father "Satan" in the use of her demonic powers. In a 4-part alternate reality mini-series, called The Supernaturals, Satana is Melissa Ramos, a Catholic girl who is possessed by a demon. She is recruited by a magician named Brother Voodoo, along with alternate versions of Werewolf by Night, Black Cat, Ghost Rider, and Gargoyle to fight a mystical threat. This version of Satana has mystical control over fire, as well as the power to fly. Despite her demonic possession, she has a very pure soul, and was going to be offered as a sacrifice by a demon called the Jack 'O' Lantern, until she was saved by Werewolf by Night. Satana appears as one of the patrons at a demonic bar in Morrigan's ending for Marvel vs. Capcom 3: Fate of Two Worlds. Satana is featured as both a boss and a playable character in the Facebook game Marvel: Avengers Alliance. Satana appears in the mobile game Marvel: Future Fight. Satana appears in the mobile game Marvel Avengers Academy. Satana was ranked #20 on a listing of Marvel Comics' monster characters in 2015. In Tales to Astonish #3, there is a character called Princess Satana. ^ Buxton, Marc (October 30, 2015). "Marvel's 31 Best Monsters". Den of Geek. Archived from the original on September 30, 2018. Satana is a succubus who seduced sinners and reduced their souls into butterflies, which she then kept in a little box and at times devours. Satana at Don Markstein's Toonopedia. Archived from the original on February 15, 2017. This page was last edited on 13 February 2019, at 17:12 (UTC).